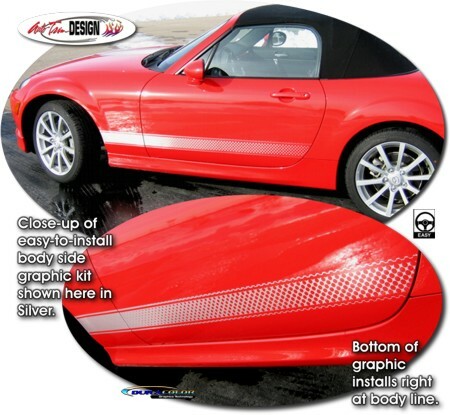 Add a unique look to your '06-'15 Mazda MX-5 Miata! Starting solid at the front, the graphics gradually fade to the rear with a unique dot matrix pattern as shown. Available in four (4) colors (Silver shown). Very easy to install, this kit is precut and only requires slight trimming at door jambs. Bottom of graphic is set to be placed at the lower body line as shown. This graphic kit measures 3.75" (95.25mm) in height and will fit any '06-'15 Mazda MX-5 Miata.